From the time of King James I in the early 17th century, British ambassadors to Venice were often accompanied by Anglican chaplains. Under Austrian rule a permanent consulate was established, where visiting Anglican clergy held services under the pan-Mediterranean Diocese of Gibraltar. In 1888, there were enough Anglican residents in Venice to form a committee to bring a permanent chaplaincy to the city. 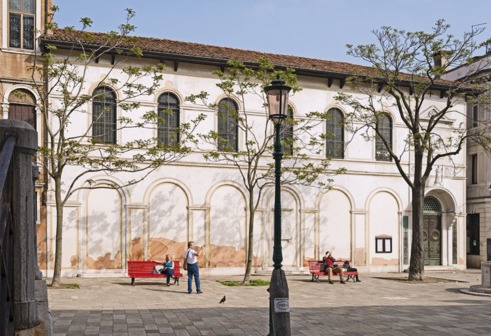 When the Venezia-Murano Glass and Mosaic Company (see the Palazzo Barbarigo, on the Grand Canal) closed in 1889, the committee purchased their warehouse in Campo San Vio and converted it into an Anglican church. On the wall is the tombstone of Joseph Smith, salvaged after the Protestant Cemetary at San Nicolò al Lido was destroyed for an airfield. Getting inside used to be iffy, but in 2016, the church became the new concert venue of the Venetia Antiqua Ensemble, dedicated to the Baroque, and especially Venetian music of the 1600s. Arrive a half hour before the concerts to get a good seat. Hours Open irregularly, but generally 8–12 and 4–6pm. Service on Sunday at 10.30am. Concerts usually begin at 7pm.